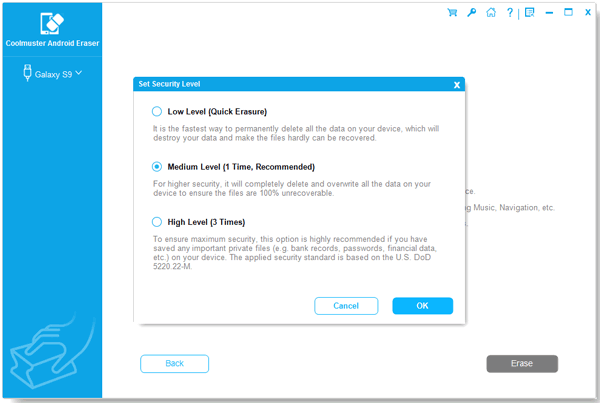 You may wish to permanently erase Samsung data due to lots of reasons, and find that the simple deletion or factory restoring settings cannot ensure the security of your data on the device because there are so many data recovery software on the market can help others retrieve your deleted, or formatted Samsung data without your permission. Horrible, right? Therefore, people like you are all looking for a 100% safe way to wipe everything on Samsung devices and you find that things are not easy as you imagine. However, you can get out of this trouble after reading this article. 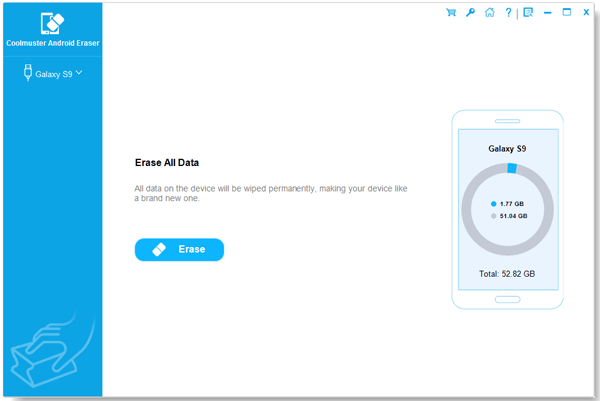 In this page, we're going to show you a simple way to erase data on Samsung with zero opportunity to restore. Here, you need to download and install a professional Android Data Eraser on your computer, then, things could be simple to you. This program is specially designed for Android users to wipe their privacy info on Android selectively or completely. The erased data in this way will never be restored, so you'll never worry about your personal info on this device will be leaked out. Cool, right? Now, just click the below link to begin the whole Samsung data erasing process. How Can I Erase Data on Samsung without Restore? Follow the instructions on the screen to finish the installation of the best Samsung Data Eraser, then launch it. After that, connect your Samsung Galaxy or other devices to the computer with USB cable. Generally speaking, your Samsung phone will be detected once it is connected to the PC, but if it is not, please restart the program and make the device be recognized like below. At present, this program only support you to wipe everything on Samsung with 1 click. So you only need to click the button of "Erase All Data" in the main screen, then everything will be done well. You can check the erasing process in the program as you like.